You can also view my latest photos on my Facebook album. My 5-month pregnant look (at the bottom of this post) is my latest testimonial of TRA's no rebound guarantee even after one year. I still can wear normal non-maternity dress size S.
It took me 13 long years to slim down. 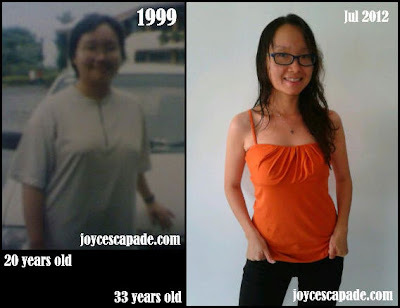 But I believe some highlights from my weight management journey are worth sharing. Here you go! I've just finished Form 6 in 1999. 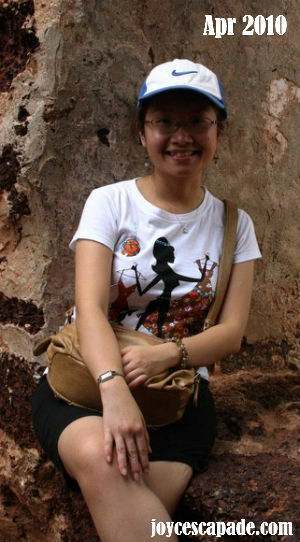 I was a petite 1.49m girl weighing 57kg. I had 1-2 small meals per day and sometimes I did binge-eating (ate way too much for one meal, and then I stopped eating completely for 1-2 days). I also walked to my classes (5-8km) every day. So, my weight dropped dramatically from 57kg to 48kg. My metabolism rate was alarmingly low. 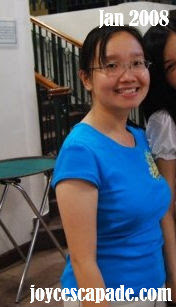 I looked frail and fragile despite being slimmer. I didn't like to exercise, thus I lived a sedentary lifestyle, and I spent quite a lot on food. I had late-night supper quite often too. My weight went up and fluctuated between 50-51kg. I definitely put on more fat and I looked chubbier and somewhat felt healthier. 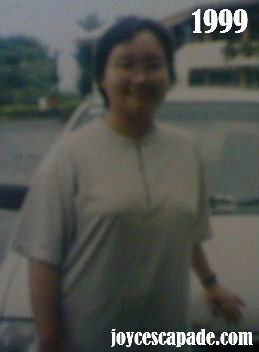 As I grew older, I found that it's much harder to shed off those extra kilos on my own no matter how little I ate. So, I signed up for slimming sessions at London Weight Management during these 2 years. It started off with a "free trial" session and before I knew it, I had spent almost RM15K in 2 years for numerous continuous sessions / treatments due to the consultants' recommendations and "professional advice". My weight did go down to 45kg but it rebounded back to 49kg within 6 months after I stopped going completely. My weight loss during this period was mainly due to water loss and some fat % loss, I was never told about increasing my muscle mass % in order to achieve my optimal metabolism rate. Because I put on weight due to rebound after stopping London Weight Management, I decided to join Fitness First gym. My understanding was that if sedentary lifestyle was the culprit of weight gain, going to gym should fix the problem. After one year, nothing much changed but I did feel somewhat healthier generally. I also began to take supplements such as Vitamin C and Evening Primrose Oil (EPO) for general health. Seeing no results from my own gym stint, I signed up for PT (Personal Training) at Fitness First for 3 months (August - October 2011). I was happy with visible reduction in fat % and increase in muscle mass %. I weighed at 45kg, I looked slimmer, and I felt really fabulous! After I used up my personal training quota, I maintained going to gym (October 2011 onwards) but my workout wasn't as intense as during the personal training period. 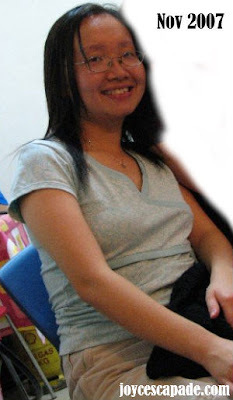 February 2012: My jeans felt tighter around the hip and tummy area and to my horror, my weight went back up from 45kg to 49kg! March 2012: I joined the TRA program - The Right Approach. 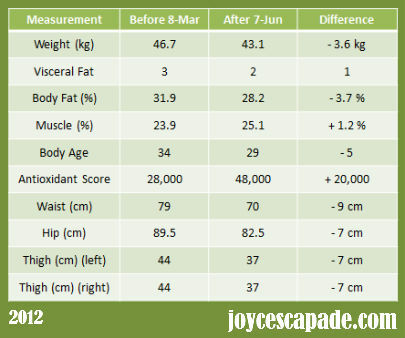 April 2012: I gained visible reduction in fat % and increase in muscle mass % in the second month of doing the program. May 2012: I achieved my optimal weight (42.5kg) in this third month. My visceral fat (fat surrounding internal organs) count dropped from 3 (medium risk) to 2 (low risk). I didn't lose much weight in terms of kg but I gained reduction in body fat %, increase in muscle %, and decrease in centimeters around my waist, hip, and thigh areas. That's what counts! I've never felt so healthy before! The LifePak in the TRA program also helped to ensure optimal metabolism rate and boost my antioxidant score which is an added bonus towards looking good. The eating guideline including in this program also helped me to build up a long-term, healthy, and well-balanced eating habit and lifestyle. I can proudly say that after 13 years, I finally found the right way to healthy, long-term weight management. More of my after-program photos here. TRA is about reduction in fat % and at the same time increase muscle mass % + build up healthy eating habit. So, it's about LONG-TERM weight management, with NO-REBOUND as its goal, not just short-term weight loss. This is exactly what I am looking for! Do not be too excited if your weight goes down drastically in a short period of time because that's most likely contributed by water and muscle loss. You don't have to go through 13 years like me. You can do it now. THREE months - that's all it takes. Trust me. Why should you do TRA? For the overweight, TRA is to shed off those dangerous layers of fat. For the chubby, TRA is to shed off those extra fat for a more streamlined look. For the already slender, TRA is to build more muscle for a more athletic look. This program is for everyone, as long as you want long-term HEALTH. When you are healthy, you are beautiful. Wow.. that's such a long journey but congrats, you are looking great now! By the way, I am really to see your successful pathway.. and result. Grats once again! According to what I learn, ectomorphs should eat before bed to prevent muscle catabolism during the night. You are the lucky type who can eat more but still burn more without much effort. WOW... u look great... how much should v pay for the TRA course?? ?